Pool Our Love is a partnership initiative between the Saskatoon Friendship Inn, the Greater Saskatoon Catholic Schools and the Roman Catholic Diocese of Saskatoon. For the Pool Our Love program, the students and staff of the schools around Saskatoon collect food items for the Friendship Inn each year. It is called Pool Our Love because each school collects the food is a small paddling pool – usually these pools are overflowing with donations. Pool Our Love is a unique food drive since we ask each school to focus on just one particular food staple that the Friendship Inn uses all the time. This targeted collection of foods like rice, pasta, pancake mix and sugar has made a huge impact on the need for the Inn to buy groceries to fill the gap between food donations and our needs. 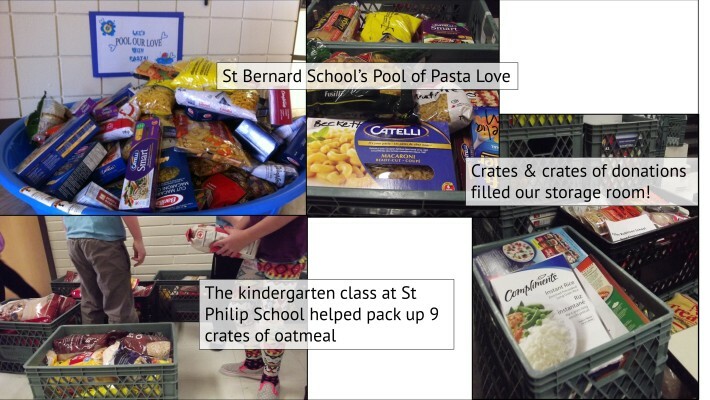 In the 2014-2015 school year, the Pool Our Love campaign collected 2509 food items, that is over 2200kg of food valued at about $7500. 242 kg of pancake mix, and 93 L of syrup, that’s enough for 9700 servings of pancakes, a weekly treat at the Inn. 74 kg of coffee was donated, that enough to make 124,000 cups of coffee. We serve up to 1000 cups of coffee a day, so this donation will keep us serving coffee for at least 5 months. 100 jars of jam, that’s 61 L of jam, enough for over 3000 pieces of toast. If your school would like to participate in the 2015/2016 Pool Our Love campaign, contact the Volunteer and Event Coordinator at 306-242-5122.